The cast of “The Diary of Anne Frank,” through March 31 at People’s Light in Malvern. The Diary of Anne Frank by Frances Goodrich and Albert Hackett won the Pulitzer Prize for best play in 1955. The less successful 1959 movie adaptation invites comparison. 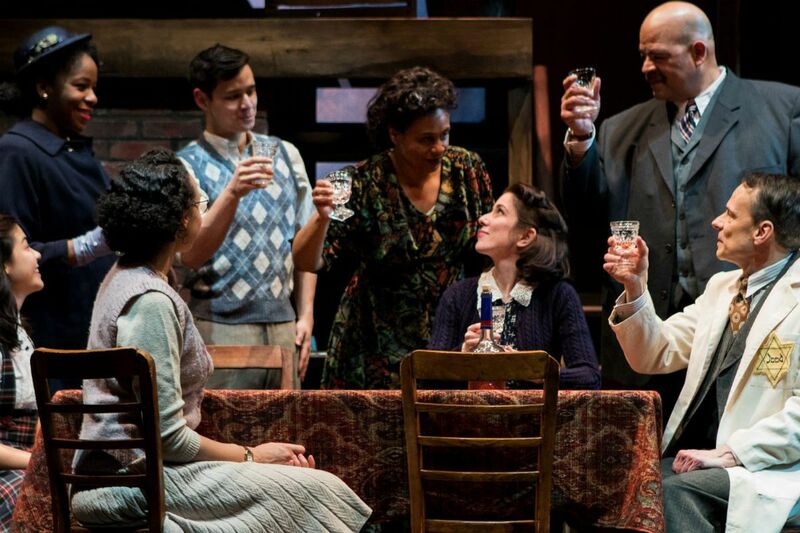 But score a clear victory for live theater in Wendy Kesselman's new adaptation of Diary, through March 31 at People's Light in Malvern, thanks in part to the superb set design of Luke Cantarella and the sound effects of Fabian Obispo. The factory attic stage set is beautiful and appalling. Platforms, doors, stairs, walkways, and terraces carve out just enough small spaces for eight refugees to hide. During the daytime, they lie low, move little, and are afraid to use the noisy bathroom. (I like how director David Bradley keeps the refugees huddling in semi-darkness during intermission while the audience mills about.) But at six o'clock you hear the clock tower, retreating boots, and a closing metal door. Then the refugees feel free to kick up their heels, or more often, get on one another's nerves. Brittany Anikka Liu is a bubbly, winsome Anne Frank. Only a kid could see this new life as an adventurous "vacation." Then you watch Anne mature into a young woman. You see the others through her eyes: Anne loves father (Mark David Kaplan), almost hates mother (Deborah Green), falls in love with young Peter Van Daan (Tyler S. Elliott), and suffers nightmares. The refugees come to terms with their grubby existence. BBC radio broadcasts give hope. But outside, you hear screeching propaganda, bombing raids, and the daily chug-chug of the steam engine with cattle cars in tow. You know how this all ends. Diary filled a void in the 1950s. By the 1960s, it had become a favorite read in schoolrooms, as a kind of tragic coming-of-age story. This popularity worried playwright Kesselman, who feared a tale of specifically Jewish suffering was being lost in clouds of schmaltz. The Holocaust was a unique grotesquerie. With reason in the service of unreason, killings were done with industrial efficiency. The camps were thrifty, too, weaving carpets from human hair, flaying skin to make lampshades. Millions of non-Jews were also massacred – gypsies, gays, others – a mind-boggling Götterdammerung of a social cleansing effort. There's no danger of the message getting lost in this production. In this Diary, you experience the Holocaust through the plight of Anne and her fellow Jews. And the People's Light production packs a wallop, as you truly feel the terror of the scapegoat victim trapped inside a monster state. Through March 31 at People's Light, 39 Conestoga Rd., Malvern. Tickets: $29-$52. Information: 610-644-3500, peopleslight.org.